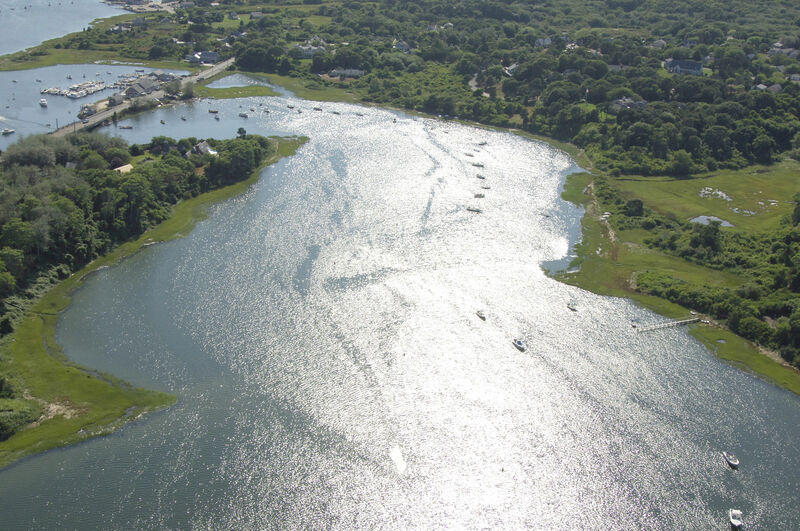 Mill Pond is located at the end of the Mitchell River off Stage Harbor at the southern end of Cape Cod. 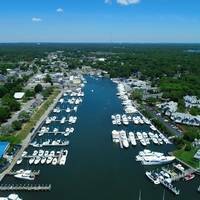 Mill pond is an excellent spot to anchor for those seeking quiet or a bit more protection than is afforded by Stage Harbor. There are no marine facilities in Mill Pond, save for a marine repair facility on the east side of the pond beyond the anchorage. 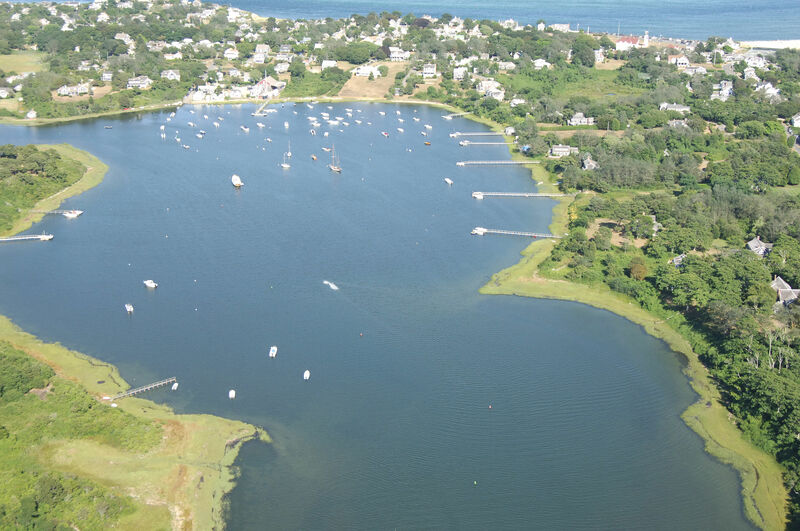 Mill Pond is 25 miles north of Nantucket and 35 miles northeast of Vineyard Haven. 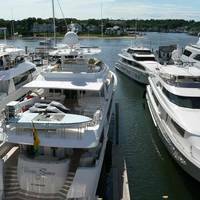 The entrance channel to Stage Harbor has a minimum depth of 9.5 feet, and the channel is reliable, even during stormy weather. The image above is a view from the southwest looking northeast over the Mill Pond anchorage at the town of Chatham. 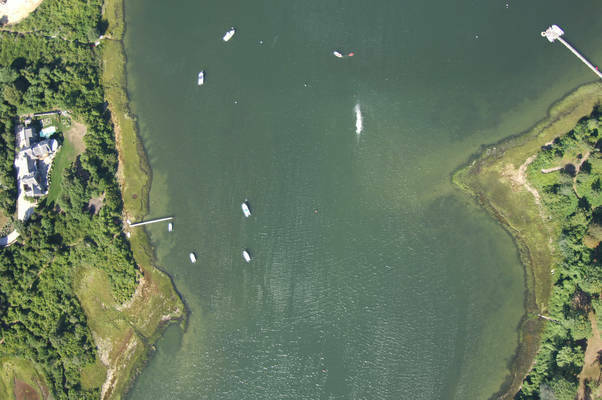 In the extreme upper portion of the image, the edge of Chatham Harbor can be seen, while the town of Chatham is just below it. The initial approach to Stage Harbor is an entry from the southwest via Nantucket Sound. Once you have navigated your way to the area, set a course for red and white Morse (A) buoy SH, which is located at an approximate waypoint of N41 39.168 W69 59.970. If you are arriving from a good distance offshore, Stage Harbor Light (42 feet above water, flashing white every six seconds) is sometimes visible up to 20 miles into Nantucket Sound. Once you have picked up red and white Morse (A) buoy SH, set a course to the west to intercept flashing green buoy 1 and red nun buoy 2 at the beginning of the channel cut into Stage Harbor. From flashing green buoy 1 and red nun buoy 2, head northeast past red nun 2A, green can 1A, red nun buoy 2B green can buoy 3, and then flashing red buoy 4 (visible in the image above) just off Harding Beach Point. From flashing red buoy 4, set an approximate course of 60 degrees magnetic for a distance of about .4 mile to intercept red nun buoy 6, and then at an extreme shoal to the north, green can buoy 7. You will want to leave green can buoy 7 decidedly to port on entry. Farther on, green nun buoy 8 will become visible before you turn toward green can 11 and red nun buoy 10. The Stage Harbor anchorage should now be visible in front of you. 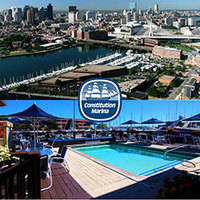 There are two marinas on the north side of the harbor, but as of this writing, they are not accepting transient guests. No reviews yet! Be the first to write a review of Mill Pond Inlet.